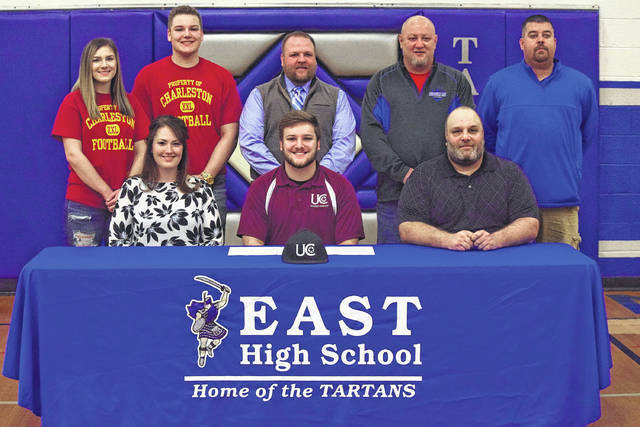 East’s Ethan Gifford signed with the University of Charleston on Wednesday afternoon to play college football for the Golden Eagles. Gifford is expected to play linebacker but is open to be moved to fill team/positional needs. Ethan Gifford on signing with the University of Charleston football program. After serving as a quarterback during his freshman year with the East Tartans’ football program, Ethan Gifford watched as his father, James, took over the head coaching duties from Todd Gilliland in 2015. Knowing what was best for not only his son, but the East football program, James advised Ethan that a move to linebacker and fullback would be ideal if the latter wanted to accomplish his dream of becoming a student-athlete at the collegiate level. So the son followed the advice of the father — and through hard work and dedication, truly soared as a two-way force for the Tartans over his final three seasons of action. Now, Gifford will get the chance to soar as a Golden Eagle, thanks to his work in the classroom and on the gridiron. The soon-to-be-graduating senior, who holds a 4.0 GPA and is a member of the National Honor Society to boot, signed with the University of Charleston (W. Va.) to continue his football career and fulfill a lifelong dream in the process. For James, the accomplishment is sweet enough as a head coach considering that Ethan is the fourth football player of the Class of 2018 to make his plans official — with fellow classmate Blaine Scott already having signed with West Virginia and Brady Douthat, along with Justin Kritzwiser, pursuing careers in the military (with Douthat also planning to walk on at Cincinnati). However, as a father, there’s no question that Ethan’s signing is the one that touches Gifford’s heart the most. And understandably, the scholarship brings a great deal of pride to Ethan, not only because the young man gets to join his girlfriend, 2017 Wheelersburg graduate Samantha Vallance — who just finished up her freshman volleyball campaign at Kentucky Christian — or his father, who played at Appalachian State for a year before having to quit due to injury — but because of the accomplishments that Gifford, who accumulated over 250 tackles in his high school career as a linebacker for a program that went 25-9 over his final three years of play, has obtained on his own. Over the course of his high school career, Gifford has been nothing less than a standout for East on his way to putting up major numbers. In addition to his 4.0 GPA and National Honor Society marks in the classroom, Gifford has translated his overall IQ onto the football field en route to becoming a menacing linebacker, as the 6-0, 225 senior has made at or over 70 tackles in each of his last three seasons while averaging nearly five sacks a year for the Tartans. But by moving from the position that is so revered in football to one that doesn’t get as much of the front-page glory or the top headlines, Gifford had to sacrifice — and successfully did so by pushing himself both inside and outside of practice. Like Scott, Ethan was a regular visitor at apPrep in Chillicothe — a performance facility that has generated high reviews from the vast majority of its consumers. As a result of Gifford’s work, East’s defense has improved as a whole as Ethan, along with his father, have helped lead a defensive transformation in Sciotoville. Over the past four years, the Tartans went from giving up 34.7 points per contest in 2014 and 31.5 points in 2015 to 15.7 points per affair in 2016 and 19.5 points per contest in 2017. Gifford’s 85 tackles, six sacks, and two interceptions in 2016, along with his 90-plus tackle season to go along with four sacks and two interceptions in 2017, were vital in said improvement — and East’s first playoff victory, which came in a thrilling 12-6 win over Waterford. At Charleston, Ethan is expected to continue to contributor at either the Will or Mike linebacker spots for the Golden Eagles, who held opponents to 25 points or less in all but two games in its 3-4 defensive look — including 19 points or less in six of those eight contests. Jalen Nelson, Luke Sears, and Keon Mabin — who are each of junior eligibility and are linebackers at UC, a Mountain East Conference competitor in the NCAA Division II ranks — finished in the top-11 in tackles on the team, with Nelson and Sears placing in the top half-dozen. Each will be back to show Gifford the ropes in 2018. But even if a position change is required of Ethan, the senior says that he is definitely open to the adjustment. And with 518 yards of total offense and eight touchdowns on 58 total touches from his fullback slot, it’s clear that the senior can certainly produce on offense if need be. However, his academic work in high school is what truly paid off. In fact, Ethan’s excellence in the classroom is what will pay for the vast majority of his experience at Charleston and what will ultimately pave the way for Gifford to establish a career in Business Management or Sports Management. However, while keeping up with academic work is a must, it’s also nice to pursue a passion on the side in order to see where one can go with it in the future. And Ethan Gifford will get to do that, thanks to his own work ethic and the respect that he has for his father. Video Caption: Ethan Gifford on signing with the University of Charleston football program.